Alternating Current (AC) is changing the direction of the current periodically; Cycle is the time of a cyclical change of the current; Frequency is the times of the current changes per second, unit Hertz (Hz). AC current direction changes 50 or 60 cycles per second, in accordance with 100 or 120 changes per second, then the frequency is 50Hz or 60Hz. Why we need to convert 60Hz 110V to 50Hz 230V, or vice? How to change 50 Hz to 60 Hz, or vice? GoHz solid state (static) frequency converter (aka AC power source) can convert 50 Hertz or 60 Hertz AC power to variable frequency (40 Hz - 499.9 Hz), variable voltage (0 - 300V 1 phase, or 0 - 520V 3 phase) through AC → DC → AC conversion, output pure sine wave, and adjustable frequency and voltage. Ideal AC power supply is stable frequency, stable voltage, resistance is approx zero and the voltage waveform is pure sine wave (without distortion). Static frequency converter output is very close to the ideal power supply, hence, more and more countries use solid state frequency converter power supply as a standard power source in order to provide the best electrical power supply environment for appliances to estimate their technical performance. 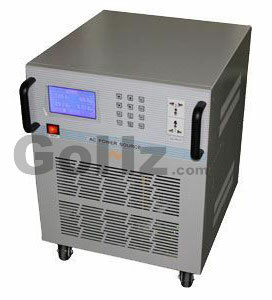 By using GoHz solid state frequency converter, you can easily convert 110V (120V) 60Hz to 220V (230V, 240V) 50Hz in one step by inner step up transformer, also you can change single phase to three phase at the same time. Now the question is, do you NEED to convert the frequency. It depends on your application. First of all, 240 volts is available in most buildings in the US. A special circuit is run to the breaker box of a standard 120/240 volt electrical service, a different outlet is put on the end of the circuit, and you have 240 volts. Now, do you need to change the frequency? - Most lighting systems work quite well on either frequency. Those that do not have transformers in them that overheat on lower frequency 50 Hz power. - Series-wound brush motors don't care what frequency the power line runs at, because the timing of the brushes and commutator determine the rotation speed, not the line frequency. They will even work on DC. - Induction and synchronous motors do present a problem, because they will run at different speeds when given different line frequencies. If the design is robust (or made for 50/60 Hz operation), it won't hurt the motor - only the speed is wrong. So in a robust electric fan, you might not notice much of a difference. - Drive motors for many record players, electric clocks, tape recorders, tone-wheel organs, and other such devices will cause the devices to run at the wrong speed. It will change the operating speed and the pitch of any music. - Most electronic devices work quite well on either frequency. Those that do not have transformers in them that overheat on lower frequency 50 Hz power. - Most dimmers are tuned to the frequency of the country where they are sold. They may malfunction on a different line frequency. This is a very nice information about something I am trying to solve and it does prove I do need to find a solution. I need to find a economical solution to convert 115VAC/60Hz to 220(230)VAC/50Hz at a max. of 100 Watt.Single phase. Does a device as I am looking for exist? Hi i have a lot power tool (like milter saw, table saw,...) and i moving to Italy where is 220 V 50hz. Can i carry with me and buy a transformer or not? Our company imports American Motorhomes from the US to Sweden. We need conversion from 230Volt 50hz to 120 Volt 60Hz. Power supply is Sweden are maximum 16 amps on 230 V so the equipment has to match that. What do you have to offer??? A 110V motor should be a single phase device. Assuming this is correct it is likely that the motor also uses a start switch and capacitors. Either way I would not suggest using a variable frequency drive. I think simply using a 220V/110V transformer rated for 50 Hz would be sufficient. The saw will suffer a both decrease in speed and in HP of about 15% but should otherwise run. The capacitors are generally rated for 50Hz/60Hz so it should be fine. Otherwise, replacement of the saw would be the best option. We are in the process of buying a Crepes making machine made in Italy. I need to know if the Is it the available voltage (220V/50Hz 1ph - 220V/60hz 1ph)works in US. Please tell me if there is 'an easy' way to convert/run a 120V 60Hz appliance on a 230V 50Hz system? I want to ship a small residential furnace from the USA to the Middle East. It has 2 motors (3/4hp and 1/4hp) and lots of electronics (that run on DC low voltage, I believe). What are my best options?? 5000 Watts 220/240 VAC 50 Hz COOKTOP INDUCTION STOVE can works in 240 VAC 60 Hz system?